What is the best practice to arrange the last slide, then?! The last slide will typically be seen for some minutes after you finished talking – until you jump to some other slide for addressing a question. This is something that you should use. If you ended your talk with a summary (which is a good thing in most cases), leaving that slide gives the audience opportunity to reflect on your talk, remember what they wanted to ask a question about, or just let your central messages sink in. If they do not want to do this, but focus on the questions, they are not distracted by anything new that you didn’t talk about. The main exception is if you find it difficult to orally convey that the talk has finished – in that case a thank you slide or an any questions? slide may be the lesser evil and save you from a few seconds of awkward silence that everybody needs to realise your talk is over. Note that you can use such a slide as a backup behind your summary slide – if you manage to finish your talk on the summary slide, the audience never gets to see it. If you botch it, you can quickly jump to the summary slide. In most situations, however, I consider thank you slides and any questions? slides pointless, as they do not tell the audience anything new and are things that you or the chair have to say. A quote would distract the audience from the questions – unless you are going to read it, but then the quote has to really fit the occasion. Your contact information does not need an entire slide and can usually be fitted on the bottom of the summary slide. one or two appetiser slides illustrating first steps into what you just announced as future work, e.g., to show that you paved the way for something interesting. In this case, you can either jump back to the summary slide or stay on your last appetizer slide – depending on what is more attractive. It's just a recent experiment, though; I don't have enough data to tell if it's the best last slide. Apart from the eye-candy, I think it can be useful as a pseudo-summary if your slides are sufficiently recognizable (for instance, if they have pictures). For sure it helps solving the problem mentioned in another answer: "You had this formula on one slide. Can you go back? ... No not that one, before that ... Ahh yes that one." If I were on your thesis committee I would be most happy with your slides if they were your original work and represented your own personal tastes and sensibilities. Therefore I would be more impressed with even a goofy or weird last slide that I knew you actually came up with yourself and made sense to you, than one that was proposed to you by people on academia.se, even if it were ostensibly more professional looking or slick. In other words, the "best last slide" is, by definition, whatever you decide it is. And yes, I realize this is a bit of a smartass answer. I am trying to make a point here about the value of original thought, and hope that some people will find this perspective helpful or thought provoking. But to anyone who doesn't get it or thinks I am barking up the wrong tree, feel free to downvote this answer. Your audience can recapitulate your talk. This allows them to better place what you told them in your conclusion and why what you did is awesome. Following the scheme "Tell them what you are going to tell them. Tell them. Tell them what you told them." makes your topic easier to understand. Since it is a graduate thesis, chances are your topic is rather complex and merits recapitulation. This is the last slide your audience is going to see and should be the "take home message". So it can be a condensed version of what you presented, now that you explained all they need to know. This is going to fortify what the audience remembers from your talk. A recapitulation also offers the referees prime material for slaughtering you (in the positive sense). You can keep all your used variable names, concepts, definitions, etc. on this slide so that the referees remember them. This makes asking questions so much easier and prevents question of the style: "You had this formula on one slide. Can you go back? ... No not that one, before that ... Ahh yes that one." If this is out of the way, you can directly jump to the interesting questions. Instead, you can take the opportunity at the very end of your talk to thank and acknowledge the people who have helped you out. Generally this takes the form of a photo of your advisor's group, often with a list of names of others in your group, along with several columns of names pointing out any collaborators. It's also nice to point out in a corner any funding sources, if you received any grants or scholarships which supported the work. If you put their names up in writing you don't necessarily need to read out everyones name, but it is good to point out some of the key people and potentially mention their specific contribution. One caution is to keep the amount of talking you do on your acknowledgment slide brief. I'd recommend a minute or so at most. Spend too long - particularly with a bland recitation of 20+ names - and you'll bore the audience. If you're going to name names, pick out just a few key people whose help you'd like to highlight. Err on the side of being too brief rather than too effusive. If you have individual names up, you can acknowledge in groups ("my collaborators in the Smith Group") rather than individually. With an acknowledgement slide you have a rather "neutral" slide that clearly signals the end of the presentation, but contains a non-trivial amount of content in itself. Note: You didn't mention which field you were in, so I gave an answer from my experience in biochemistry. Do keep in mind that presentation styles do vary somewhat from field to field. If it's not common in your field for experienced people giving seminars to present an acknowledgement slide, please ignore my answer and pick something that's more common to your field. Most people won't remember where they had questions without some help. So if you want questions from the audience, end with a summary slide. And if you don't want questions, just write: "Thank you! Any Questions?" That's how my thesis tutor described it, great advice! Underneath, I included my email address and any other main researchers - with a statement that if they wished to receive a copy of the presentation to contact by email - but check to see if this is allowed first. This way, while questions and/or discussion was occurring, a clear and concise summary of the presentation remained projected. Having gone through many variations myself, more recently I settled on putting a brief bibliography on the last page. I think it is more meaningful than a "thank you" or "questions?" page (certainly more meaningful than some "inspirational" quote! ), and perhaps more appropriate than contact details. Of course it does not prevent me from having a summary (if applicable) on the next-to-last page. I have not yet had to prepare and present a thesis but I have done a lot of presentations for my studies. I usually use a dark background for my first slide, with the title in a light coloured font and use a light background with dark text for the presentation so my solution is to have a blank last slide with a dark background. I usually thank the jury for their attention verbally, as a sign the presentation is finished so I do not need to thank them "in text" which feels awkward. I also avoid the "Any questions ?" slide, especially if it is going to stay on display. I rather say something close to "If you have any question feel free to ask them I/we will do my/our best to answer them". The reason I don't leave the summary visible too long is that I find I tend to read it over and over again when watching a presentation rather than listening to other peoples questions. If I'm like that I'm sure, or at least I hope, other are as well. US Military typically employs option 3 as the penultimate slide, followed by a slide asking for questions, followed by the statement or a slide "This concludes my brief" or presentation. For the presentation of a thesis, option 3 is always good for a penultimate slide at which you can ask for questions. I'd follow that with a thank you slide to conclude. Thank you for your attention, professor N.! 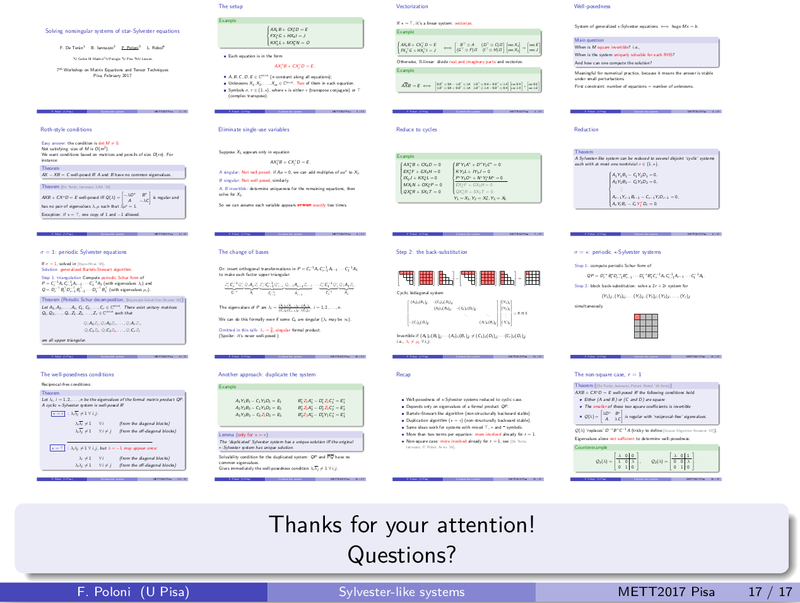 Since I sometimes find it hard to round-off a presentation without creating an awkward silence, but do not like having a slide saying only "Thank you", let me offer one more alternative. Have a last slide with a summary/conclusion of your main results, and possibly some future work. Also end the talk by quickly reiterating your main result(s). Then at the end, let the words "Thank you" (or "Questions?" or whatever you want to end the presentation with) appear at the bottom of this slide. I usually use a slightly larger font and different color, such that it stands out. This allows you to smoothly end your presentation, yet keeps the useful summary slide on screen during the discussion. This will depend largely on what happens after your presentation. If the last slide will stay on screen during discussions between the thesis committee and you, a picture representing your work (e.g. your thesis cover) might be a good choice. Best way to end your presentation is to give an overview of whole things you described in earlier slides. you can also request for feedbacks for your presentation to improve according to audience point of view. Not the answer you're looking for? Browse other questions tagged thesis presentation or ask your own question. Postdoc job inteview presentation - slide “livery” / logos and references? Is it appropiate to put a funny funny slide in a Bachelor thesis presentation?